Gadara (Modern Um Qeis or Qays) is part of the Tentative list of Jordan in order to qualify for inclusion in the World Heritage List. Umm Qays is located on the top of the mountain with a view of many historical regions – Jordan Valley and West Bank, See of Galilee, Golan Heights and Syria. In a good weather even Mount Hermon and Nazareth is visible from here. Its unique location made it a pilgrimage place for Palestinians that had to escape to Jordan after Six-Day War – from here they could look at most of their lost homeland. As Umm Qays is very close to the border with Syria, even tourists have to pass through military checkpoint (one of few where they really examine foreign passports). 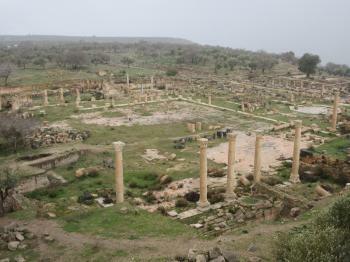 Umm Qays is a ruined town of ancient Gadara, one of greek cities in Palestine that formed a union called Dekapolis. The area is quite large and although some of the remnants are quite well preserved, overall the site seems to be a bit chaotic. It is even easy to lose orientation there. Some of the buildings were restored and now serve as utility rooms and museum (unfortunately closed on Friday when I visited the site). Overall the site is nice but comparing to another T-listed site of Jerash its chances to be inscribed seem to be much lower.